Samsung Update is a free application for Windows that provides you with downloads and installations of the latest software, firmware and drivers for your Samsung PC. 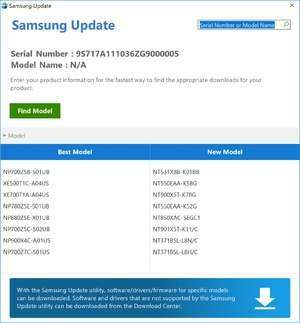 To use Samsung Update, simply enter your product information for the fastest way to find the appropriate download for your product. Samsung Update is a free application for Windows that provides you with downloads and installations of the latest software, firmware and drivers for your Samsung PC. Version 2.2.9.42 is a freeware program which does not have restrictions and it's free so it doesn't cost anything. For security reasons, you should also check out the Samsung Update download at LO4D.com which includes virus and malware tests. Additional screenshots of this application download may be available, too.